I’m in love with Victoria Schwab’s writing style. This book will stick with me. It’s themes of humanity and monstrosity, the blurred lines between good and evil, were perfectly expressed. Imagine a world where all bad deeds have consequences and those consequences come alive, and you’ll be half-way to understanding the world created in the Monsters of Verity duology. I read this way back when it first came out, in the months where reading time was severely limited by the challenges of finishing a brutally intense undergraduate degree. 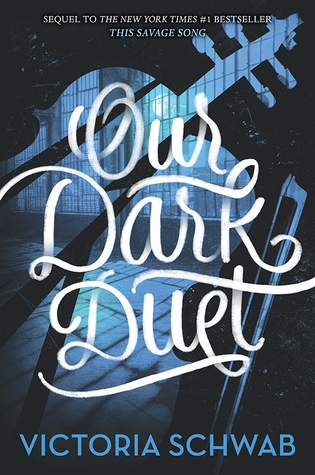 Despite all that, I pre-ordered Our Dark Duet months in advance and when my release day copy was delayed bought a Kindle copy to keep me going. This Savage Song was just that good! The weird thing about a duology is that you’re both getting to know and saying goodbye to the characters you love all at once. I would have loved more time with August and Kate, to learn more about their friendship and explore their world. Although… it is just possible that this series would have been diluted by an increased size, its beauty and impressiveness distilled with each additional page. I know that lots of times in the past, my interest in something has declined knowing that there’s plenty more to go around. I much preferred the chapters exploring August’s perspective and found him a much more interesting character. He was just so fascinating. Part of that is linked to the themes at play in my current WIP — the idea of what humanity means is something that’s on my mind a lot at the moment. For the benefit of those yet to read the beauty that is Schwab’s prose, I’ll leave out in-depth discussion of my feelings on the ending. Heartrending. Bittersweet. And when you tear through the pages to that final chapter? Well, what happens was probably inevitable. But that doesn’t make it any less sad. A fantastic book by a master storyteller – a must read!